Reduction mammaplasty is one of the most common procedures performed in plastic surgery. Insurance companies use resection weight as one of several criteria for pre-approval. One commonly used formula to calculate minimum resection weight is based on body surface area (Schnur sliding scale). In our practice, surgeons estimate and record resection weight at the initial consultation. The purpose of this study is to determine the accuracy of subjective resection estimates versus objective resection weights at our institution. Retrospective chart review of bilateral breast reduction mammaplasties performed at a single academic medical center by seven plastic surgeons from January 2011 to December 2017 was performed. Patients undergoing oncoplastic reduction, simultaneous additional body-contouring procedures, or lacking complete data were excluded. A total of 762 patients were reviewed. Absolute and relative error between pre-operative estimate and actual resection weight were calculated. The median error overall was 105 g (range 70 to 185 g for individual surgeons). When normalized by resection weight, this represents a difference of 11% to 36%. Taken as a group, the frequency of underestimation (40.5%) and overestimation (55.7%) were similar. Of our seven surgeons, one tended to overestimate, three tended to underestimate, and three under- and overestimate equally often. In 19% (n=291) of reduced breasts, the resection estimate was less than the Schnur requirement. For 3 patients, insurers denied coverage explicitly due to the resection estimate being less than the Schnur requirement. In 23% (n=352) of reduced breasts, the resected weight was less than the Schnur requirement. To our knowledge, no insurance claim was denied a posteriori due to resection weight less than Schnur. 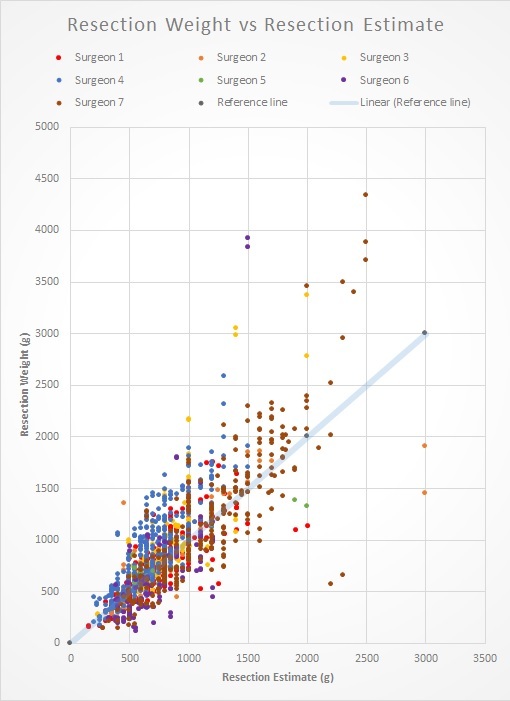 As expected, individual surgeons vary in the accuracy of their resection estimates. Since insurance companies use resection estimates and potentially resection weight to determine pre-authorization and payment, respectively, this could be problematic, particularly for surgeons with a tendency to overestimate. Collation of a surgeon's personal data may reveal the direction and magnitude of estimation error. Knowledge of this error could be used by the individual to improve the accuracy of pre-operative estimate.